I read this article and found it very interesting, thought it might be something for you. 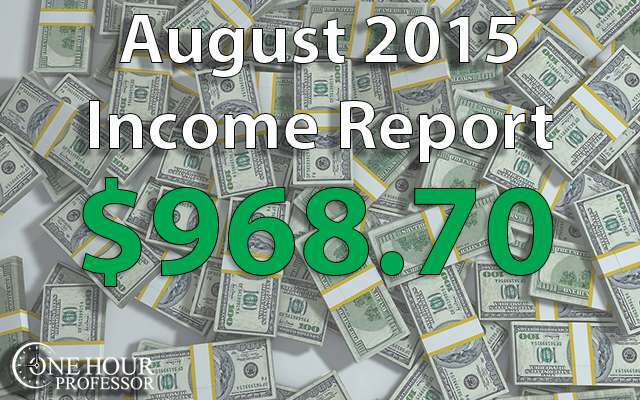 The article is called August 2015 – Monthly Income Report and is located at http://www.onehourprofessor.com/august-2015-monthly-income-report/. This month was one of the most productive months I’ve ever had. Not only did I reveal my authority website (which posted $39.68 in earnings from two weeks of being live) but I also finished my first book! Beyond that, I made quite a bit of money in consulting and also other income streams continued to climb. While I’m not sure exactly what the future holds, I’m extremely encouraged by what I’ve been seeing recently. It looks as if my new authority website is poised to be a winner and my business, and guest posting opportunities, are continuing to grow. If you want to watch and learn some lessons along the way with me, I highly recommend that you sign-up for my email list. I’m not going to lie, it was definitely a month of hard work. As you can see from my time report, I logged just over 45 hours and contracted out 43 hours of work. The fact that I put in (collectively) 88 hours of work this month goes to show that a lot of things got done. One of the biggest things that I’ve been preaching lately is the idea of sharing your content. I can’t tell you how many times I’ve created an in-depth blog post that I thought was truly great, but after I posted it I heard crickets. The reason for this is simple, I didn’t share it with anyone. Yeah, I posted it to social media, but the truth is that I don’t have a huge social media following and when I post there, I don’t get a lot of traction anyway. I covered how I’ve been sharing my content with the authority website in my eighth post of the authority website series and it’s been going really well. After I got done with that post, it was time to reveal my authority website URL. I’d be lying to you if I said that this didn’t make me nervous. I contemplated the idea of never sharing my authority website URL, but then I realized that I have put in at least 200 hours between myself and my contractors for this website and if someone wanted to try to do what I was doing, they are going to have to work around the clock to make it happen. In other words, I’m confident that I’ve created a quality resource and I know other people will have a very hard time replicating it, so I don’t mind sharing the URL. In addition to that, I had a pretty good month in July and had a nice income report to prove it. I also did the standard hour of social media where I simply post all of my updates for Twitter. I will say that I’m really getting into Periscope recently and didn’t include that time in this report because frankly, I forgot to log it. But obviously I’ll try to do that in the future. The majority of my time this month was focused on the authority website experiment. A lot of the time was simply responding to emails that my virtual assistant sent out, while another large part of my time was focused on writing my Jobs for Felons book. This guide is about 50 pages and has a ton of helpful resources and advice for those who have been to prison and are looking to get employed again. If you know anybody who could use it, I suggest that you send them to this link. The last thing that I worked on was my general website housekeeping items. Some of this was website revisions, consulting work, and other miscellaneous pieces. Income Breakdown by Main Channel: I’ve decided to add this area in my income reports because I want to be able to reference how much I make on each channel that I have. This makes sense because I anticipate that I will continue to grow and keeping track of this will be important to know what channels are really working. Please note, I didn’t include historical data here, I just included data from August 2015 and beyond. I’m not going to lie, this month was pretty cool. Not only did I get a good amount of consulting income, but I saw some of my highest earnings through my passive income streams. Shutterstock: To be completely honest, this was a weird amount of revenue to earn for the month. What ended up happening was someone bought a image for $20 and I guess my commission for that was $4. I’m not complaining, but it was just a little odd. Legal Match: This is the service that connects people with lawyers for free. As of now this comes from one blog post I created, but I anticipate that this income could increase in the future with my new authority website. Google Adsense: I saw a nice little increase here this month and anticipate that this number will continue to climb as my new authority website has pretty much doubled my earning power here. Udemy Course Sales-Google Analytics: My first Udemy paid course continues to bring in a few bucks a month. This course is specifically for Udemy instructors, and if you’re thinking about creating a Udemy course it’s definitely something worth snatching up. Ninja Outreach: This platform has quickly become one of my favorite tools that I use. I focused so much on sharing my content recently and this platform is what makes my job much easier. I anticipate that the $19 of income that I made was because I rank number one in Google for “Ninja Outreach Review”. If you’re wondering, yeah, I’m pretty thrilled about that. Long Tail Pro: It was a nice little surprised to see this sale in the income report this month. I’m not sure how it happened, but somebody decided to take my advice and purchase Long Tail Pro. I assure you that it’s well worth your money and was happy to see someone doing the right thing. YouTube Channel: Another thing that climbed quite a bit this month was my YouTube channel earnings. What I’ve been doing is every single Periscope that I complete, I’m then posting here and if you haven’t checked it out yet, I highly recommend that you do, there’s a lot of great information here for you. Indeed.com: A huge contributor to my passive income this month was from the Indeed job search engine and this is all because of my new authority website. Quite honestly, I wouldn’t be surprised if next month this one source made me over $100 in passive income. We’ll see what happens, but I’m very excited to see what this next month brings. Consulting: As mentioned earlier, I didn’t get any new clients but I did have some clients who I’ve worked with for a while ask for some work to be done. I’m really liking this consulting thing and think I’m going to write a few blog posts soon to help you understand more about what I do. Aweber: I continue to collect recurring commissions on AWeber and one cool thing was that I got another person to sign up this month. I don’t think I saw any revenue from that because they get the first month for free, but I imagine that this will kick in next month. Expenses this month were a little bit higher than last month, but that’s because I’m still working on my authority website and had to purchase access to some pretty amazing tools. Ring Central: I needed a fax line in order to have one of my contractors do research and this was the service I used. It’s pretty cool because if somebody sends you a fax, it comes straight through as an email and you don’t even have to have a fax machine. Ahrefs: I did a lot of research and found out that this is the most reliable tool to see what websites are linking to specific articles. This is extremely important for my outreach efforts and I’ll probably use this tool for quite some time. Call Rail: This is the platform that I’ve been using to record my client calls for my consulting gig. I realize that I haven’t been disclosing this in my income reports and didn’t even think about the fact that it should be included, so I’ll do so moving forward. Elance.com: My expenses for Elance were pretty high this month, but I’m pretty sure that they’re going to continue to climb. This is because I don’t want to work on tasks that I can hire other people to do for less than $10 per hour. My hourly wage is worth much more than that and if I have mundane tasks, I always outsource them. YES! I literally just finished it a few days ago, but I’m happy to report that my e-book is complete. I think I’m going to put it on Amazon eventually, but I released the first edition and so far it’s gotten some pretty awesome responses. Specifically, I was asked by an organization in Texas if they could email it out to their entire list and include an announcement on their homepage that it was available. How cool is that?!?! This was my second goal for the month and obviously I did this as well. I didn’t have control over this one necessarily, but I was able to get my authority website reveal post shared by few people. Specifically, Spencer Haws who owns Long Tail Pro and Justin Cooke with Empire Flippers. An interesting thing that’s happening with all of my outreach is that I’m getting a lot of connections and even some guest posting opportunities which I’ll announce once I’ve completed them and they go live. BOOM! Trifecta, I hit all of my goals this month. Woop woop! I’m super excited about this and intend on making it my flagship course for the OneHourProfessor.com website. If you want to have access to the early release of the course, you need to sign up here. Keep up the great work Ron! Your persistence and hard work is paying off! That’s great! Consulting is a great way to earn some money and kickstart your online business. Wow… good progress. Congrats mate!